Shortly after midday Wednesday, Theresa May will have a good idea whether her arch-rival Jeremy Corbyn can help save her Brexit deal. On Tuesday evening, she abandoned her strategy of making Brexit a project of her Conservative Party and Northern Ireland’s Democratic Unionists, apparently accepting that this will never gather enough votes to get through Parliament, and asked Corbyn, leader of the opposition Labour Party, to rescue her. At noon, the pair will face each other across the House of Commons, for her weekly Prime Minister’s Questions session. His approach, and her response, will offer a clue as to how their talks about a joint Brexit approach are going to go. But only some of May’s enemies will be facing her. Behind her on the Conservative benches will be plenty more opponents. Their anger -- or silence -- will be a guide as to whether her new strategy can survive. The prime minister’s appeal to Corbyn opens the door to the possibility of a much softer form of Brexit, potentially keeping the U.K. inside the EU’s customs union. It would be a massive breach of May’s own negotiating red lines, but good news for business. The pound rose. Corbyn welcomed May’s move and said he would be “very happy” to meet her, and the first response from the EU side was positive. No schedule for discussions has been announced, but May’s office said she wanted to move fast, so it’s likely the pair will sit down in private after their public face-off. After seven hours of talks with her cabinet ministers, the premier said the U.K. will need an extra delay beyond next week’s potential cliff-edge deadline of April 12 to resolve the crisis. 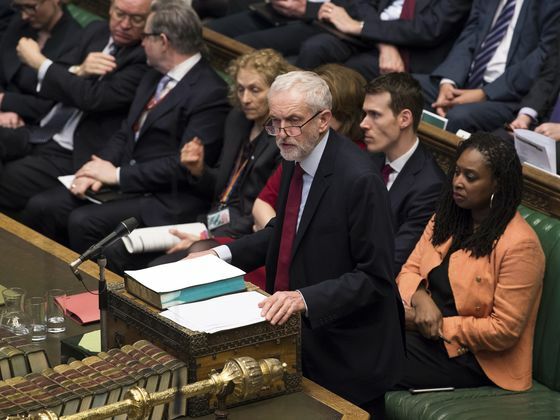 The prime minister’s offer to Corbyn is another sign of the desperation and disarray that has overtaken her government as it struggles to complete Britain’s acrimonious separation from the EU. Parliament has rejected the deal she negotiated with the bloc three times, with Corbyn’s Labour consistently voting against it. She has tried cross-party talks before, but they led nowhere. Negotiations with Corbyn to agree a joint plan to ensure the U.K. leaves the EU with a deal. This will focus on the future relationship. A May-Corbyn plan would be put to Parliament for approval, and the premier would then take it to the EU leaders’ summit on April 10 to be signed off. If May and Corbyn can’t agree, they would put forward “a number of options for the future relationship” between the U.K. and the EU, for the House of Commons to vote on. The government would promise to deliver whatever Parliament decides. Legislation would then follow to allow the U.K. to leave the EU and avoid the need to take part in European Parliament elections next month. May said her unpopular Withdrawal Agreement, which deals with the terms of the divorce, rather than the future partnership, will need to be passed as part of any arrangement with Corbyn. In the past two weeks, rank-and-file politicians have taken control over the Parliamentary agenda in an attempt to solve the crisis themselves. But none of the Plan B options they’ve put forward has won a majority. In the most recent set of votes Monday, a proposal to keep the U.K. in a customs union common tariff zone with the EU came closest, losing by just three votes. That process will continue Wednesday afternoon, with Parliament discussing a plan to force May to seek a longer extension to negotiations. Lawmakers could view that as unnecessary in view of May’s statement. Corbyn said he wants a customs union with the EU and continuing access to “vital” markets. “And we’ll ensure that those are on the table,” he said. Membership of the EU customs union, with its single tariff regime and common trade policy, would destroy one of the main prizes of leaving the bloc for Brexit supporters: setting Britain free of European rules to be able to strike trade deals with other countries around the world. May made leaving the customs union a red line during two years of talks with the EU. That might now have to change. For Corbyn, too, the talks present a challenge. Many in his party want a referendum on the Brexit deal, and will want him to demand one as the price of Labour support. But holding one would cause Labour big problems, as the party’s voters are split on Brexit. Corbyn’s policy to date of refusing to bail May out has got him close to the general election he wants. Although helping her now could split her party, it could also split his.